The Thermo ST16R refrigerated centrifuge is designed to meet the needs of a broad audience. 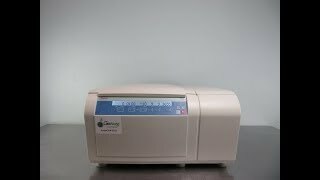 For over a century Thermo Scientific has been providing reliable centrifuges within the scientific community and the Thermo Sorvall ST16R is no exception. This general purpose benchtop centrifuge is ideal for sample preparation including cell culture, clinical applications, as well as microplate processes able to handle all of your separation needs. The Thermo ST16R comes with easy to access, intuitive controls which simplify operation. The Thermo Legend ST16R has a maximum capacity of 1.6 liters and features an auto-lock which allows you to change out rotors with a push of a button. This new push button rotor featured called the Thermo Auto-Lock is designed to increase lab productivity by giving the user flexible options of conveniently changing out rotors within seconds. The Thermo Sorvall ST16R Refrigerated Benchtop Centrifuge includes a motorized lid latch which gives you the ability to close the centrifuge lid with one finger in a downward motion, making it a cinch on tall lab benches. In addition, this refrigerated centrifuge comes with SMARTspin technology which automatically identifies which rotor you’re using at any given time, maximizing safety along with improving separation particularly in pelleting applications. The Thermo Scientific ST16R is glove friendly and holds Biocontainment certification by CAMR within the UK. In addition, this benchtop centrifuge also includes nine acceleration protocols and ten deceleration rates along with built-in timer. Moreover, the Thermo Sorvall ST16R comes with six separation programs and plugs directly into a standard 115V 50/60Hz. Instrument uses CFC-Free Refrigerant to cool down centrifuge chamber and has a settable temperature range of -10° to 40°C. Contact us to learn more about our Thermo Sorvall ST16R Refrigerated Centrifuge. This listing for a Thermo Sorvall ST16R comes with the pictured rotor package has been fully tested. As part of our refurbishment process the service team inspects every element and component, replaces any degraded parts and checks operations. This refrigerated centrifuge’s speed range is tested using a NIST traceable laser tachometer, at various levels and temperatures prior to being listed on our website. When installing the centrifuge a 4-hour settling period should be followed to allow the compressor to settle prior to powering on. Instrument is ready to ship via freight with dock-to-dock services.